Harambee – Working together for the Common Good. Harambee meaning ‘working together for the common good‘, or Meitheal in Irish, is an entirely voluntary initiative of primary school teachers and volunteers in Mukuru slum settlement in Nairobi, Kenya, working in partnership with students and staff at the Institute of Technology Tallaght (ITT Dublin). 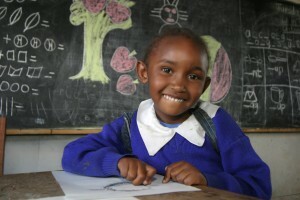 Founded in 2006, Harambee provides scholarships to children living in the Mukuru slum to attain a secondary education. Since then Harambee has supported up to one hundred pupils to progress to secondary school. The children of Mukuru are bright and intelligent, and filled with all the hopes and dreams and enthusiasm of children worldwide. Yet, because secondary school fees are often beyond the means of families in the slums, few of these children can ever hope to achieve their dream of continuing their education beyond primary school. In addition, because of many cultural and social barriers facing girls hoping to enter secondary school, Harambee guarantees 50% of scholarships to girls. With the support of our donors, we offer these children the chance to fulfill their dreams, helping them build a brighter future for themselves and their families – and indeed the community of Mukuru – in the future.